Color(s): Fawn, mahogany; with black overlap. There is black shading on the muzzle and tail. Originating in Belgium, the Belgian Shepherd Laekenois breed was developed for the herding and guarding of sheep. 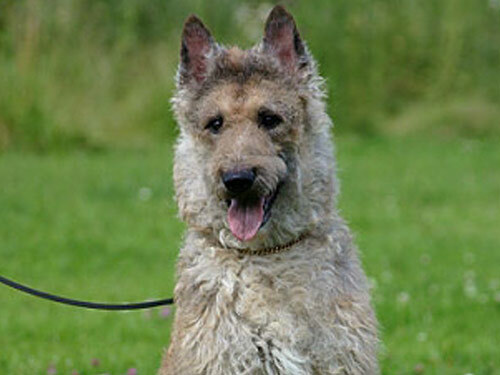 The Laekenois is one of four breeds of Belgian Shepherds and is considered to be the rarest of the four. They are the only Belgian Shepherd in the United States not recognized by the AKC. A medium sized breed, the Belgian Shepherd Laekenois is squarely-built and has an unkept appearance. They are sturdy, hardy, agile, and athletic. Their most distinctive feature is their rough and wiry coat. The Belgian Shepherd Laekenois is not recommended for inexperienced dog owners. This breed is extremely loyal, vigilant, and protective. They thrive on human companionship. They do not do well if left alone for extended periods of time and will become destructive if lonely or bored. Belgian Shepherd Laekenois's typically bond to one particular family member. They do well with children they have been raised with. It is important that this breed is never engaged in chasing games, tug-of-war, or rough-house play. They are not recommended for homes with non-canine pets. They will do well with dogs they have been with from puppyhood. They are suspicious of strangers and will guard and protect their family, property, and territory. Daily combing of the coat is essential to prevent matting. Professional trimming should be done twice a year. Bathing should only be done when absolutely necessary. The Belgian Shepherd Laekenois breed is prone to such health issues as eye problems, skin allergies, and hip and elbow dysplasia. The Belgian Shepherd Laekenois has a rough, shaggy, wooly, and water-proof coat. The head and muzzle are fringed and there is dense, bushy hair on the tail. The Belgian Shepherd Laekenois requires early, intensive and ongoing socialization and obedience. This breed is demanding and dominant. They will not respond to harsh or heavy-handed methods. Training must be done with firmness, fairness, patience, consistency, and reward. Belgian Shepherd Laekenois's require an inordinate amount of physical exercise and mental stimulation. They are not recommended for city or apartment living. The Laekenois does best in a rural setting with a job to do and ample room to safely roam and run. They excel in herding, search and rescue, tracking, police work, and sledding.